Should Detroit’s Bankruptcy Be an Early-Warning Sign for Washington? In an interview last week about Detroit’s bankruptcy, I explained that the city got in trouble because of growing dependency and an ever-rising burden of government spending. I also warned that the federal government faces the same challenge. Washington is in trouble mostly because of poorly designed entitlement programs rather than excessive compensation for a bloated bureaucracy, but the end result is the same. Or, to be more accurate, the end result will be the same in the absence of genuine entitlement reform. The Washington Examiner has the same assessment. Here’s how they conclude a recent editorial. More than anywhere else in America (with the possible exception of Chicago) Detroit has been a one-party union city. Democratic politicians backed by the United Auto Workers and public employees unions have ruled virtually as they pleased. Along the way, many of the politicians ended up in jail on corruption charges and the bureaucrats made out with sweetheart deals on pensions and health benefits. Those sweetheart deals now account for most of the $20 billion in debt that put the city into bankruptcy. There are too many disturbing parallels between Detroit and America. The national debt of $17 trillion gets a lot of attention, but the reality is the government’s actual debt, counting the unfunded liabilities of Social Security, Medicare and federal employee and retiree benefits, exceeds $86 trillion, according to former congressmen Chris Cox and Bill Archer. As they say, things that can’t go on forever, won’t. I used to warn that America was on a path to becoming Greece, but maybe now I should use Detroit as an example. Some of America’s best political cartoonists already are using this theme. Here’s one from Glenn McCoy. Since I’m not overly optimist about either Illinois or California, I also think it’s just a matter of time before this happens. Keep in mind, however, that there was plenty of wasteful spending in both Illinois and California under Republican governors, so this is a bipartisan problem. Speaking of California, here’s a good cartoon by Lisa Benson. Amazingly, some people think California’s no longer in trouble because a retroactive tax hike collected more tax revenue. Yeah, good luck with that. Next we have a cartoon by Rob Rogers of the Pittsburgh Post-Gazette. 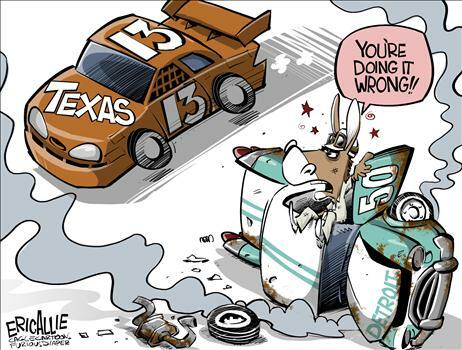 And last but not least, Eric Allie weighs in with a cartoon comparing Texas and Detroit. On a serious note, it would be interesting to see how Detroit looks compared to cities in Texas, such as Dallas and Houston. But let’s end with something that’s really hilarious, albeit by accident rather than on purpose. A few people want to enable Detroit’s profligacy. Here are some excerpts from a story in The Hill about union bosses wanting a federal-state bailout of Detroit. Union leaders are calling on Congress and President Obama to provide a federal bailout to the city of Detroit. The executive council of the AFL-CIO, the nation’s largest labor federation, called for an “immediate infusion of federal assistance for Detroit” to be matched by Michigan, which they say has not done enough to keep the city from going through bankruptcy. 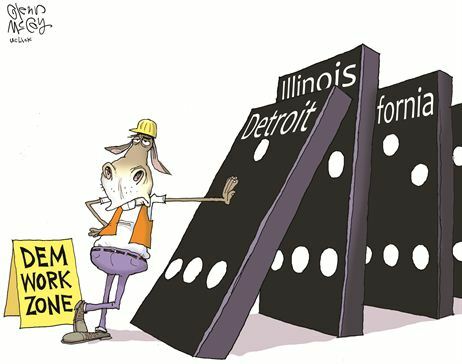 …“It appears that Governor [Rick] Snyder and [Emergency Financial Manager] Kevyn Orr are pushing Detroit into bankruptcy to gut the modest benefits received by Detroit’s retired public service employees,” the AFL-CIO’s statement reads. I suppose I could make some snarky comments, but I’ll close with two vaguely sympathetic responses. First, there’s no way a bailout of Detroit goes through the House of Representatives. Heck, I don’t even think it could make it through the Senate. So some folks on the left would be justified if they asked why the high rollers on Wall Street supposedly deserved a bailout a few years ago but they don’t get one today. The answer, of course, is discrimination by color. But I’m not talking black vs white. The color that matters in politics is green. The financial industry dispenses huge campaign contributions to both sides of the aisle, and the bailout was their payoff. Public employee unions, by contrast, give almost every penny of their money to Democrats, so there’s no incentive for GOPers to do the wrong thing. Second, I have no idea whether retired bureaucrats in Detroit get “modest benefits.” I’m skeptical for very obvious reasons, but the real problem is that the city screwed up by having too many people riding in the wagon without paying attention to whether there were enough people producing in the private sector to pull the wagon. Is that the fault of the garbage men, clerks, secretaries, and other municipal employees? That’s a hard question to answer. They obviously weren’t calling the shots, but they were happy to go along for the ride. At some point, they should have paid attention to the message in this Chuck Asay cartoon. P.S. For readers in New Jersey (and also New York City), I’ll be speaking this Wednesday, July 31, at the Friedman Day luncheon sponsored by Americans for Prosperity. Politicians, whether D or R have no clue. Government spending has increased more in the last 50 years under Republican administrations than Democrat (no, really!). They all thing big government is OK… as long as their party is in charge. 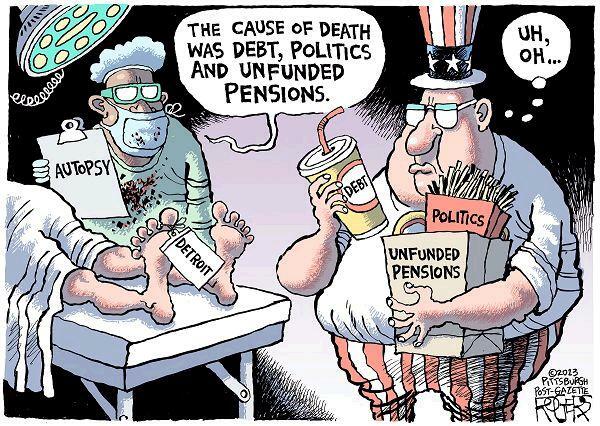 Law of unintended consequences? What is that? 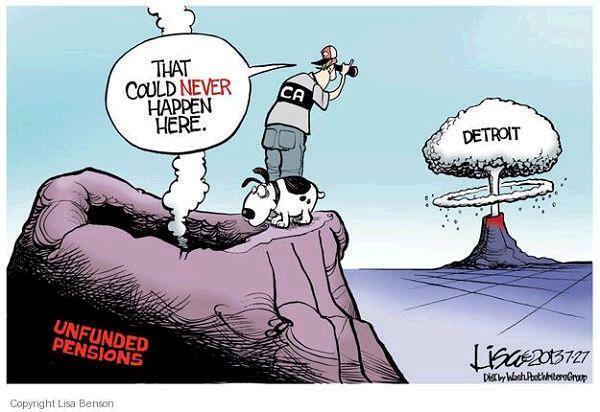 from cnn money: “Detroit’s financial crisis hasn’t derailed the city’s plans to spend more than $400 million in Michigan taxpayer funds on a new hockey arena for the Red Wings.”……………………………….. Sounds like there are plans afoot for Detroit to dump health support for workers and retirees, which opens up the possibility that the federal government would pick up the tab through Obamacare. This would allow the President to do an end run and bypass Congress, using Obamacare. This could be the model for future bailouts of other troubled [Democratic] cities and states, if the plan works. As Ayn Rand educated us, the victims of the fall of Detroit is the fault of the victims. They let it happen. They chose to work for the parasitic government. Those are the risks. Liberals have no understanding of the Laffer Curve and it keeps getting them in trouble.